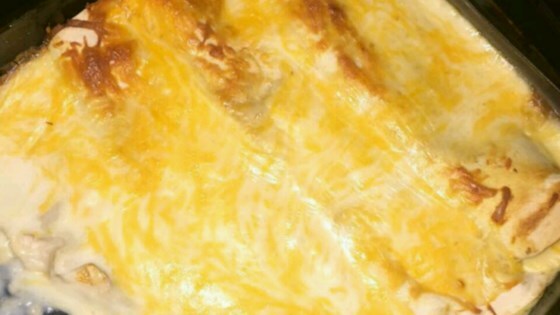 "A simple but tasty enchilada recipe. A family favorite." Preheat oven to 350 degrees F (175 degrees C). Grease an 11x15-inch baking dish. Place the chicken breasts in a saucepan with enough water to barely cover; bring to a boil over medium heat. Reduce heat to medium-low and simmer until the chicken is no longer pink in the center, about 15 minutes. Remove from the pan, drain, and shred with two forks. Place the shredded chicken into a bowl and mix with 8 ounces of Colby-Monterey Jack cheese and canned green chilies. Spoon about 3 tablespoons of chicken mixture in a line down the center of each tortilla and fold the tortilla in half, enclosing the filling. Starting at the filled side, roll the folded tortilla into a cylinder. Place the rolls into the prepared baking dish with the seam sides down. In a bowl, whisk together the soup, half-and-half, chicken broth, and about 1/3 of the 2nd package of shredded Colby-Monterey Jack cheese. Pour the sauce over the enchiladas, sprinkle remaining Colby-Monterey Jack cheese over the casserole, and let stand for 10 to 15 minutes. Bake in the preheated oven until bubbling and the cheese topping is melted and beginning to brown, about 25 minutes. See how to make incredibly quick-and-easy chicken enchiladas. I made this recipe last night for company and had never made enchiladas before. Everyone loved them and even took leftovers home. Would make this recipe again. Very good. Delicious! I put the oven on broil for only a few minutes before taking it out of the oven which crisped it up nicely. These enchiladas were moist and cheesy-I can't imagine even the pickiest eater not loving them. It made a big pan of them-plenty for a very large family or guests. I will make these again. Chicken was bland, tortillas were soggy from the sauce. My family did not like this recipe. I love to use a rotisserie chicken to speed up the process.